Conversion on the Way to Damascus, by Caravaggio, c. 1600-01. Santa Maria del Popolo, Rome, Italy. Now! If this weren’t a website dedicated to religious art, you might suspect that this was not a religious painting at all! Instead, you may simply see a picture of a man who fell off of his horse. And Caravaggio did that intentionally! But, in this case, St. Paul’s conversion is remarkably subtle. Yes, he just had the most life-defining moment of his entire existence in which Jesus Christ speaks to him directly and personally in a way that he absolutely can’t ignore. And yet, to everyone else, life continues as usual. The man above him seems more interested in attending St. Paul’s horse than St. Paul himself. St. Paul’s world has been shaken up completely, and yet the world continues on as it always has. And, isn’t that the way conversions often happen to us? When God speaks to us, if God speaks to us, it can shake us to the very core of our existence. And yet, it is difficult to explain the moment to most people, or how incredible it was, since to others it can often appear as a normal moment. And, if we are living our faith so as to impress people, often these moments of profound insight can be discouraging, because we simply cannot express the majesty of God to those who simply see it as yet another ordinary moment. Yet, if we live out our faith and use that first conversion as a stepping stone to learn more about God and to develop our relationship with Him, then God can transform us into His Hands so that we can change the world. 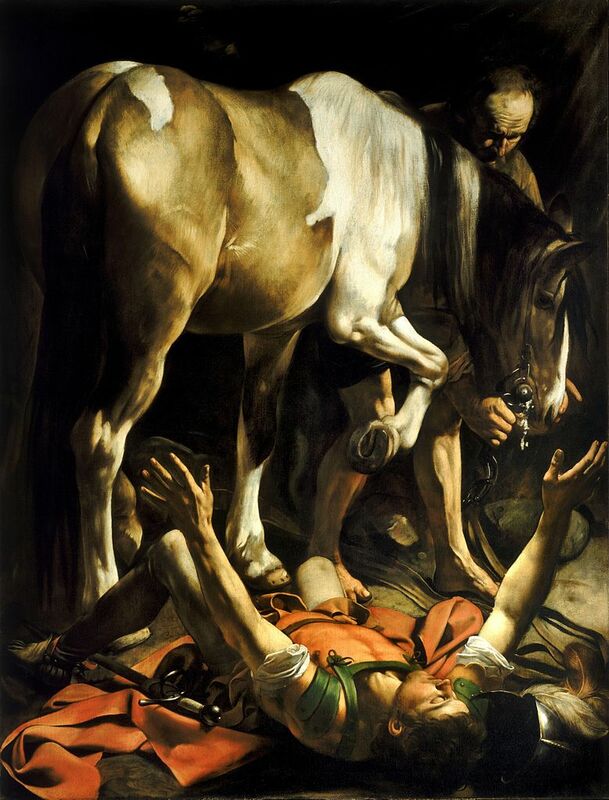 After all, St. Paul did not immediately become a saint at this moment, nor did the church initially accept his tale of his encounter of the Lord. He had to humble himself greatly and wait patiently in order to finally be able to evangelize and to use his gifts as God intended them. And even then, it was hard work, as he relates so honestly in his letters. So! Let’s take this as an opportunity to examine our own spiritual lives closer and make sure that we aren’t living simply to impress people, but rather living so as to encounter Jesus. And, if God does call us in some spiritual duty, let us approach that duty with humility and gratitude, so as to live like St. Paul. Look closely at the picture. If you weren’t aware that this was a religious artwork, what would you think that this scene depicted? What emotions do you think are going across St. Paul’s face as he lies on the back? What about the man attending to the horse? Have you encountered any sort of calling from God? How did your experience align with St. Paul’s? How did it differ? Convert and reconvert our hearts to Yours. Let us never shy from doing Your will.